Lilies are flowering plants that boast an array of shades and shapes. They belong to the Liliaceae family and can be found in a variety of places around the world. The genus Lilium consists of more than 100 different species of this beautiful flower. Most of them grow in temperate and tropical areas. The plant has a long stem and the funnel-shaped flower blooms in the spring and summer seasons. Contrary to popular belief that all flowers have a sweet fragrance, the truth is that only white lilies are scented. Colored lilies have no scent at all with the tiger lily being the exception because of its sweet smell. These lilies have large, bright yellow flowers. Although they are usually grown for their flowers, some species are also known for their edible bulbs. 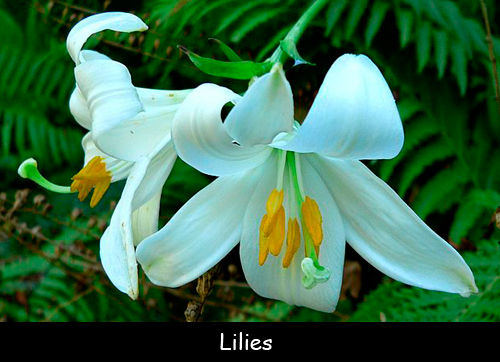 Cats enjoy the scent of lilies very much but these flowers are toxic for them. So keep your furry friends away from your flowers. The oil extracted from these flowers has amazing softening and healing properties. These flowers have long vas lives and you can make them stay even longer by removing the pollen. Lily is a perennial plant. These plants can be defined as the ones that can live for two or more years. They are popular garden plants and can also be grown in containers. Tiger lilies are the most flamboyant of all the lily species that can be planted in the garden. For great results, these flowers should be planted in groups of three or five identical bulbs. Declan, Tobin. " Amazing Facts for Kids about Lilies ." Easy Science for Kids, Apr 2019. Web. 18 Apr 2019. < https://easyscienceforkids.com/all-about-lilies/ >.